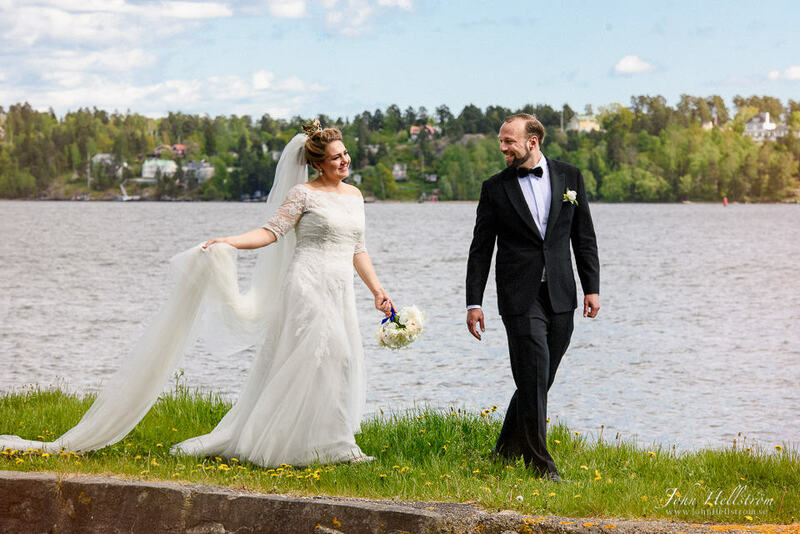 Louise and Malcolm married in Lidingö, an island in Stockholm, Sweden, a sunny day in May. Louise dad Jochum escorted Louise to the altar, with the bridesmaid Desireé behind them. An emotional moment when the groom Malcolm and the groomsman Kristian saw the bride in the church. The wedding reception was held at Elfvik mansion, on Lidingö in Stockholm, Sweden. It has a magnificent view down at the archipelago. A walk beside Stockholm archipelago, a few hundred meters away from Elfvik mansion. The toast master Karl Magnus (camera left) and the bride's father Jochum (camera right) presents the married couple. John Hellström is a portrait and wedding photographer in Stockholm, Sweden.